THIS WALK IS SOLD OUT! THANK YOU FOR YOUR INTEREST AND SUPPORT! October is Rockland History Month! Where: Meeting location will be provided with your confirmed, prepaid reservation. 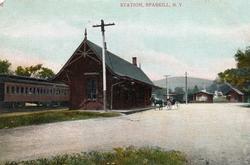 Sparkill was considered a hub in the 20th century. Though small and developed after nearby communities, Sparkill had many essential functions of a larger community, including transportation, government, a variety of retail stores, churches, hotels and other public establishments. Led by Larry Vail, joined by long-time residents Joe and Flo D’Auria and Judy Peaks, this tour is a short flat walk (about 0.4 mi.) on Main Street where many of these functions existed -- some surviving today. The walk will conclude at Arbor Hill Landscaping and Garden Center for a hot dog and beverage. OR CALL THE MUSEUM OFFICE AT (845) 634-9629 (WEDS-FRI, 10 AM-5 PM). Cancellation policy: Due to the overwhelming popularity of the Walks through History, the $7 registration fee is non-refundable. Space is limited for safety. A waiting list will be compiled, and spaces that become available will be filled on a first come, first served basis. Only those who have made full payment can be accommodated.